This festival is celebrated in May. The specially arranged Kalyana Mandapam in the Narayanagiri gardens is the venue of the celstial wedding of Lord Srinivasa and Goddess Padmavathi. Pomp and gaiety mark this three - day celebration performed in the evening. In this colorful ceremony conducted on Navami, Dasami and Ekadasi in the month of Vaisakha, Sri Malayappaswami, the festival deity of Lord Venkateswara, arrives in style on Gaja, Asva and Garuda Vahanas while Sridevi and Bhudevi arrive on separate palanquins. 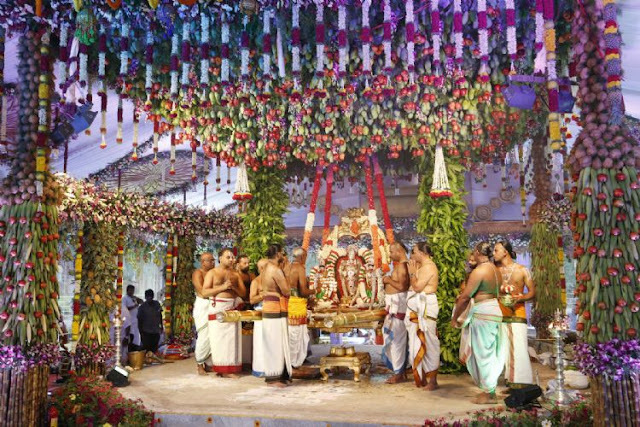 Every day after the wedding in the Kalayana Mandapam 'Koluvu' is held. A number of cultural proframmes like Harikatha, dance and music take place. Later the Lord along with Sridevi and Bhudevi return to the temple. thus, the three-day long grand wedding cermony comes to a close. Devotees who purchase tickets for the wedding cermony performed each day can take part in this annual seva.